How Much Fiber Should We Eat With Flexible Dieting? Fiber is really important for those on the Flexible Diet and counting macros. And I’ll be honest, Flexible Dieting can be deceiving. Some people are under the illusion that we (flexible dieters) just eat crap all day, enter it into myfitnesspal and call it “Healthy Eating”. Although it’s not the true, the Flexible Dieting community doesn’t do itself any favors when we flood Instagram with pictures of donuts, pop tarts, and pizza. The truth is, we ARE into health. We’ve just redefined it. Turns out eating well for 6 days and binging on the 7th isn’t healthy. Not for your body, not for your mind. And so Flexible Dieting is designed to be both healthy and sustainable. Sustainable because you can fit whatever foods you like into your diet and healthy because you do that while tracking your fiber intake. 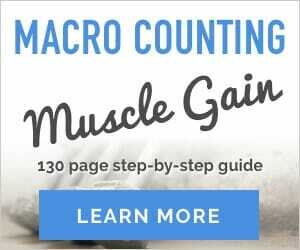 Please try out our new mobile-optimized Macro calculator here. Fiber could also be considered the fourth macronutrient. Flexible Dieters track protein, fat, carbohydrates, AND fiber. Soluble Fiber: Dissolves in water. It changes as it goes through the digestive tract, where it is fermented by bacteria. As it absorbs water it softens and helps the waste move through you body. Sources of Soluble Fiber include; Fruits, vegetables, lentils, peas, beans, oats, barley, oatmeal, potatoes, and dried fruit. Insoluble Fiber: Doesn’t dissolve in water. As it goes through your digestive tract it doesn’t change form. Sources of Insoluble Fiber include; Bran, wholemeal flour and breads, brown rice, whole grain cereals, vegetables, edible peels of fruit, nuts, and seeds. Here’s also a more in-depth breakdown. You may have heard fiber is good for you and that high fiber diets are healthy, But why? Truth be told I didn’t even think about the presence of fiber in my diet until I started tracking it. I’ve now discovered fiber effects everything from reducing your cholesterol levels (Which can protect you from heart disease) to keeping bowel movements regular and your digestive system healthy. Foods high in fiber are also usually dense with micronutrients, vitamins, and minerals. A diet low in fiber can lead to a host of health problems. The importance of a fiber-rich diet cannot be stressed enough. Fiber = Freakin’ Awesome! So How Much Fiber Do I Eat? So here lies the question, right? How much fiber do I have to eat before I can fill the rest of my calories/macros with pizza and pop-tarts? I’ve heard suggestions like “Women under 50 should eat 25 grams, Men under 50 should eat 38 grams”. What I don’t like about those suggestions is there’s no taking into account the individual. Are our “Women Under 50” morbidly obese eating between 4000-5000 calories a day? Does the “Man Under 50” only weigh 150lbs and eat 2,000 calories a day? I prefer to base it off of the number of calories an individual is eating. The formula I use is 14g of fiber per 1,000 calories consumed. Let’s say you’re 195lb Male who eats 2,730 calories. You’d multiply 14 (fiber) x 2.7 (per 1,000 calories) which equals 37.8, which we’d round up to 38. So your final macros, including fiber, could be: 195g Protein, 76g Fat, 317g Carbohydrates, and 38g fiber. The only caveat to the formula above is for smaller women. All woman should have at least 25 grams of fiber daily for good bowel health, so if the formula puts you under that, default to 25 grams. In the simple form, I think about flexible dieting like this: Quantity (Calories) determines your size and Quality (fiber – micronutrients etc) determines your health. So I am hitting all of my macros and I’m staying within my calorie range, but my fiber macro is supposed to be 19, yet I end up eating 30 or more grams a day. Is this okay? I still hit my 129g of carbs macro, I just eat alot of high fiber carbs. Will this sabotage my cutting? Hi Tisha, Who told you that your fiber should be 19 grams? Actually, 30 g is more in the range of what is considered healthy so I would tell you to leave it. Fiber really is important. Has anybody tried The 3 Week Diet? I’ve been struggling to find a good diet program to follow, but I found this recently http://WWW.TINY.CC/21DAYDIET and it seems to be getting great reviews online! I eat a lot of fiber. I don’t think I could function normally if I ate less fiber. I try get about 30 grams a day or so, but it’s usually more than that. You really can’t go wrong if you follow a very plant-based eating program. I am lucky that I can maintain a weight in the 150’s at 5 11 to 6 foot height consuming over 3000 calories a day- I do exercise (bicycle) 365 days a year, usually for at least an hour. I also probably eat more than 14 grams of fiber per 1000 calories since I eat a mostly whole foods, plant based diet- I do eat some processed foods, but I am cutting down. For instance, if I eat a cup of beans instead of meat, I would get about 15 grams of fiber vs getting none in the meat. Even substituting nuts for meat, as I do, I would get a lot more fiber. I am always counting calories, even in maintenance, but I am not tracking fat and carbs, but trying to make sure I get enough protein by eating a lot of nuts, seeds, whole grains and legumes. Green vegetables also have good protein, even though not a lot. I am getting a lot of fat from the nuts, but a lot of carbs from the whole grains and legumes. I also consume Red Star nutritional yeast which has good protein, as well as B complex vitamins, and it is fortified with B12. Can a person get too much fiber on a plant based diet? Could it make a person so regular that they wouldn’t absorb enough nutrients? Also, even “treats” can be made healthier by being made with whole grain flour, with nuts and flaxseed being added as well, and maybe sweetened with bananas and dates.